The SAT Reasoning Test (formerly Scholastic Aptitude Test and Scholastic Assessment Test) is a standardized test for college admissions in the United States. 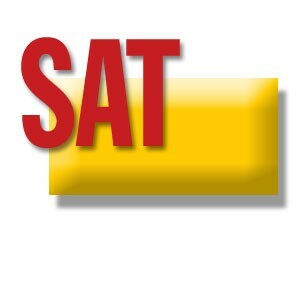 The SAT is owned, published, and developed by the College Board, a non-profit organization in the United States. It was formerly developed, published, and scored by the Educational Testing Service which still administers the exam. The College Board claims the test can assess a student's readiness for college. The test was first introduced in 1901, and its name and scoring have changed several times. The current SAT Reasoning Test, introduced in 2005, takes three hours and forty-five minutes, and costs $45 ($71 International), excluding late fees. Possible scores range from 600 to 2400, combining test results from three 800-point sections (math, critical reading, and writing). Most high school students are told they need to take the SAT and many are told that they need to "get ready" for it, but nobody seems to tell the vast majority of students where they need to start and what they need to do. Everything you need to know is available online. The problem is there is no systematic procedure or checklist to help you navigate the start-up process - until now! Student Information - Go to the College Board website and click SAT. Become VERY familiar with the information on ALL the links that pertain to you. Parent Information - There is a section for parents on the website. Have your parents review the information on this site. Online Practice - Take the Online Practice Questions. Don't short-cut yourself on this. Make sure you read each link associated with these pages so you thoroughly understand how the SAT will ask questions. Read each question, select your answer, and review the answer explanations to see how you did. Keep track of which ones you got correct and which ones you didn't. Practice Test - Download the SAT Practice Test and the scoring sheet, and take the test. We recommend you print the test out and take it a pencil, and grade your test. The College Board website is at http://www.collegeboard.com. 1. Get a user account and have your parents get one. 2. SAT Question of the Day - this keeps your brain in the SAT Mode - thinking about it every day. The College Board site also has My College Quick Start, College Search resources, and help with Financial Aid.